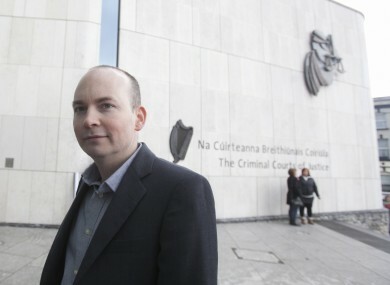 ANTI AUSTERITY ALLIANCE TD Paul Murphy has defended seeking legal aid in relation to his trial on charges of falsely imprisoning acting Tánaiste Joan Burton during a water charges protest almost 18 months ago. Murphy took criticism in the Dáil today over the application, made last week. Murphy faces two counts of false imprisonment of Ms Burton and of Karen O’Connell at Fortunestown Road, Jobstown on 15 November 2014. Today, a 16-year-old boy was sentenced to six months in prison for his part in the protest. As a TD, Murphy is entitled to an annual salary of €87,258 before tax, which he said amounts to €4,000 a month. But Murphy said he doesn’t receive a full TD wage because of an arrangement he has with his party. Instead, he takes a ‘young worker’s wage’ of just over €1,800 a month after tax. He said the rest of the money goes to a ‘solidarity fund’ for various campaigns, as part of an agreement with the Anti-Austerity Alliance Party. That decision was called a “disgrace” by Fine Gael’s Alan Farrell, but Murphy shot back. Deputy Murphy asked him to withdraw the remark and was critical of attempts by TDs to “use a debate on gangland killings to make cheap unfounded allegations and criticism of me in relation to legal aid”. Murphy said he applied for legal aid after his case was moved from the District Court – where he did not apply for legal aid and paid his fees – to the Circuit Court, where he said the trial could potentially last for up to six weeks and the fees could be over €100,000. He said: “I could take an entire TD’s salary for the next year, not spend any of it and I still couldn’t afford to pay those legal fees. “I would therefore be denied access to justice”. Fianna Fáil’s Eugene Murphy said TDs were “well looked after” and that Murphy’s decision was “damaging for democracy”. Quite a number of the ordinary citizens of this country have expressed the opinion that we should ask questions about this and specifically seek Deputy Paul Murphy to account for his actions. Fine Gael TD Patrick O’Donovan said “people around the country are outraged” at the manner in which free legal aid is being administered. “There is something seriously wrong with our country when that can happen. Murphy took to Twitter after the debate, saying Fine Gael and Fianna Fáil TDs were a “bit sore that water charges were suspended”. Comments are turned off on this article as the case is before the courts. Email “Paul Murphy says he couldn't afford legal fees "even on a full TD's salary"”. Feedback on “Paul Murphy says he couldn't afford legal fees "even on a full TD's salary"”.